What type of validation is needed? How is a validation method invoked in MS AJAX? That type of flexibility could sometimes make the run-time behavior very unpredictable. When a function is called with an argument type that you didn’t intend, the function might actually fully get executed, but the results might seem very strange. If the codebase is small, this problem can be resolved quickly, but if you have to figure out the problem inside, say, a huge library, it would become pretty frustrating. Correct number of arguments. In general, you want the call to be made with the exact number of arguments. Two exceptions: some of them are optional arguments and you are explicitly expecting a parameter array. Proper type for each argument. You have developed the function assuming the arguments are of some type every time the function is called. So, a mechanism for type checking is required. The comment part of the validation serves as a nice documentation. The Function object is extended with a ‘private’ _validateParams method. The arguments object and an array of objects in JSON format are passed as arguments to this function. The above statement will make up an object with two properties: name and type. The name property will be a String with value “typeName”. And the type property will be an object with value String (the built-in and extended String object). Let’s look at these functions a bit more closely. The _validateParams calls other validation methods. Following is the complete listing of _validateParams method. Some important pieces of the above function are discussed below. The arguments passed to the method and an array of expected parameters are passed as the arguments to the _validateParams method. Then this method calls _validateParameterCount to see if the correct number of parameters are passed. 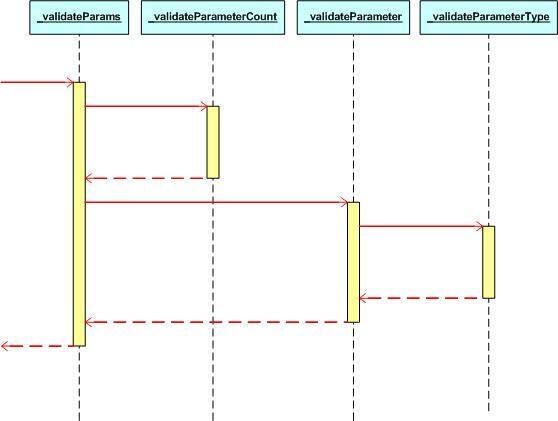 Then for each parameter, _validateParameter is called to check whether that individual parameter is ok. This method checks if the length of the passed argument list is same as the number of objects in the expected parameters array. For example, in the following call to registerClass, several interfaces are listed at the end of the call (Sys.IDisposable, Sys.INotifyPropertyChange, Sys.INotifyDisposing). While the registerClass takes a maximum of 3 parameters, here the call is made with 5 parameters. The last 3 parameters form part of a parameter array. In this method, type of method is validated for both the individual parameters and the parameter array. AJAX How does an MS AJAX extender control get initialized on the client side? AJAX How does a namespace get registered in MS AJAX?